Look Quick! A Christopher Higgins Sighting! The group of people capable of scoring 40 points in an NBA game would fit comfortably on a city bus. Eighteen have done it so far this season. That's one fewer than the number of people in the U.S. with a net worth of $10 billion. It's an exclusive club, and in the back of that club is a small, even more exclusive space reserved for the most amazing players of all — the men less than six feet tall who can win this tall-man's game all by themselves. 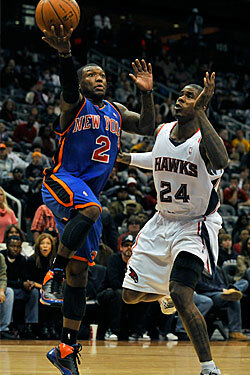 And in that room, sitting alone, or more likely bouncing on the balls of his feet and shadow boxing, is Nate Robinson. Taking into account the fact that, on New Year's against the Hawks, Robinson was coming off the bench and hadn't played in a month, his 41-point explosion is almost certainly unique in the history of the league. The lead-up to Friday — Nate's fourteen-game relegation to the bench — has been well chronicled: D'Antoni's claims that the decision wasn't personal, Robinson's agent's demand for a trade, Nate's attempt to distance himself from said agent, GM Donnie Walsh's suggestion that, with no trade offers forthcoming, the Knicks might consider buying out Robinson's contract, continued chants of "We want Nate" at the Garden, and the back and forth over the NBA's decision to fine Robinson $25,000 for his agent's comments. Meanwhile, the Knicks tightened up their defense and went 9-6 in December. But they began to sputter offensively at the end of the month, and D'Antoni put Nate in the game in Atlanta on Friday with three minutes remaining in the first quarter and the Knicks trailing 11–20. In a way, it was the perfect setup. To that point, the game had been as sluggish as you might expect for New Year's Day. The Hawks sent their offense through frontcourt scorers (who were making David Lee look like something less than an All-Star) and lacked the quickness to match up with Nate in the backcourt. To his credit, Nate reportedly worked hard to stay sharp during his banishment, which seems plausible; he entered the game with fresh legs and the sort of motivation that, say, veteran Hawks guard Mike Bibby probably wasn't feeling. Immediately, Nate began darting about like a top let off its string. He fired up a three and missed, but sneaked in for a weak-side tip-in later on the same possession. Within minutes he had scored on pull-up, a crossover, a step-back, and a deep three. "This," Clyde said, "is why his sequestation is over." (All Clyde quotes should be considered [sic]'d.) In the second half, Nate supplemented his jumpers with a series of hesitation drives. Time and again, including on a pair of game-tying layups in the final minute, he was by his defender in a single step and at the hoop before the Hawks' shot blockers, Josh Smith and Al Horford, could get over to stop him. 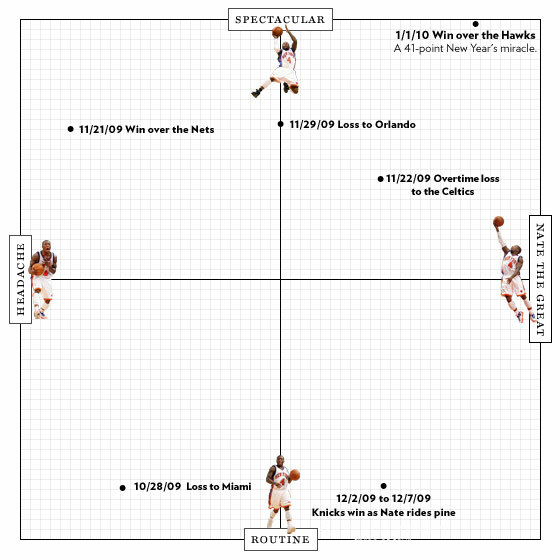 Then came an overtime sequence that was, pardon the expression, Nate Robinson in miniature — a dizzying combination of bullheadedness, brilliance, mental lapses, hustle, and showboating. With four minutes to play and the game tied, Nate missed an ill-advised crossover pull-up. (Of course, almost all of Nate's shots seem ill-advised until they go in.) Then he stole the ball from Josh Smith after doubling down in the post, drove the length of the court, drew a foul, scored on Mike Bibby, flexed and yelled into the rafters ... and missed the free throw. After a Hawks basket, he blew straight past Marvin Williams through the lane and scored, made a bad switch on the defensive end that led to a mismatch and easy basket for the Hawks, and threw away an easy perimeter pass. After a Hawks miss, he made a stop-and-go, one-handed, high-arcing baseline layup while being fouled, and hit the free throw. Finally, with the Knicks up three after another Hawks miss and the entire coaching staff yelling to slow down, Nate pushed toward the basket, nearly lost the ball, recovered, and on an isolation at the top of the key, hit a crossover, pull-up three to seal the game. The shot and resulting celebration left D'Antoni in a simultaneous grimace and grin that said everything about the project of coaching Nate Robinson. How do you control a player whose main asset is frantic, improvisational energy? And what do you do with him on a team that lacks a genuine go-to scorer? It's a riddle D'Antoni has yet to solve. But, for now, Larry Hughes is out of the rotation — and, during last night's win over Indiana, the Garden crowd got to greet Nate's entrance into the game with a standing ovation.